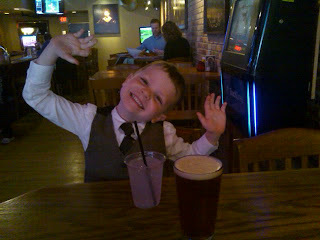 My littlest boy asked me if I would put his "dressed up" picture on a beer label. Since I am such a nice dad (some people would disagree with that sometimes, but really I am a nice dad), I told him I would certainly do that. Unfortunately, all the brews I had planned near future already had labels or were really not ones that I wanted to put a cute little boy on. Obviously, I needed to come up with a new recipe for Connor's label. The name of the beer came to me almost immediately: Stone Soup. Connor loves the story of Stone Soup. Quite often he collects rocks and other ingredients to make his own stone soup. And, I've always thought that Stone Soup would make a good name for a beer ("always" might be an exaggeration considering I've only really been thinking about good beer names for a little over a year). I called Connor over to help me design the label. Of course, Tyler saw Connor's picture on the label and wanted me to add his too. Together, the boys decided they wanted the river background (rushing over stones) and came up with their own beer quote. The quote is not quite as funny as some of my others, but that is just my opinion. The boys like it. So, what kind of beer would be called "Stone Soup"? Well, you probably know the story, but basically, in the book, stone soup started out as a real simple recipe of stones and water. As villagers got more and more curious, everyone started bringing and adding their own additions until a wonderful meal was made for the whole town. So, a beer called "Stone Soup" should be highly flavorful, and probably pretty complex. But, I do want a good beer, so I don't want to add too much random stuff to the recipe. Really, the way I declared Tweedle Beetle Ale as a way to use up unused hops would make sense for something named "Stone Soup" as well. Since, that philosophy would make for a hoppy beer, I thought maybe an Imperial IPA would be an appropriate style. However, I recently listed to Jamil's Can You Brew It on Nogne 100 . The head brewer at Nogne told Jamil that the idea behind the 100 was the desire to make a huge hoppy American -style Imperial IPA, but that his partner said that he really liked dark beers. The two guys ended up compromising by making an Imperial IPA and simply adding enough black patent malt to get the SRM up into the dark beer range. I've never tried it (don't even know if my liquor store has it, and I sort of doubt it does), but Jamil and his crew really liked the Nogne 100, and were amazed how such a simple recipe yielded such an interesting tasting beer. This approach really appealed to me, so I decided that rather than make a regular old Imperial IPA, I'd darken it up a bit and see what happens. I added in a few extra ingredients that have been in other beers I've brewed, but really this ends up being simple enough that I do not think I am over-doing the flavors. We'll see. I was going to call it an Imperial Red Ale, which is what Jamil proposed that the Nogne 100 might be appropriately categorized as. But, I would have to abbreviate to fit in the site menu, and I did not want IRA in the name, so I decided to go with IDA (Imperial Dark Ale). You can review the recipe at the Stone Soup IDA page at the SheppyBrew website. I have no idea when I'm going to brew it. I do have my brewing schedule pretty full, but I may bump other things back to get this one in sooner. Not sure. By the way ... I bottled up my Quarter Life Crisis Red Ale, using 14 of the cool customized bottle caps that my sister's family got me for my birthday. I actually hit both my OG and FG numbers on this beer. The sample tasted great. It was not as intensely hoppy as I figured it would be, but great non-the-less. Might have to increase the dry-hop on the Stone Soup to get more hop intensity into this one. Another BTW ...I tried a QA taste of Tweedle Beetle Ale today (technically yesterday) after the bottling session. It is simply the most Tweedleicious beer ever created. It is dark and roasty / chocolaty / coffee-like with an amazing head and is wonderfully balanced with the hops. It is absolutely a "stay-at-home" beer, and I could really feel the alcohol, but absolutely no alcohol taste. This is a great beer. Of course, I am supposed to let this condition for a long period of time. I cannot imagine it will get much better, but I will wait another month or so before trying it again. That is, unless, I crave it and find myself "needing" another QA taste. The power just went off to the house while I was on the computer. 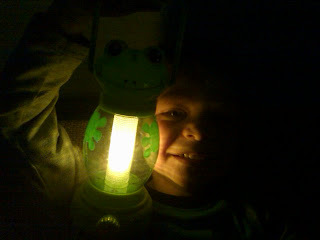 A couple months ago, the power went off in our house right before my wife needed to make a conference call for work. Must have been a snow day or something. She had a heck of a time finding the right number to call since it was in her email and the computer was off. Eventually she figured it out without missing much of the call. Not a huge deal, but it certainly was not an ideal situation. After that experience, I went out and got a battery backup for our computer and cable modem. So, now I am able to keep working while the power is out. I am pretty sure this is the first time we have tested the battery backup. Good news ... apparently I got everything plugged into the right spots! I tried some mead last night. It was horrible. Yes, I brewed it. I do not know if I am just not a fan of mead, or if I just screwed it up. My guess was a combination of the two. Oh well, I wasn't expecting much out of it, anyway. Well, I will shut down the computer now. I am not sure how much life the battery has in it. It is only been recently that I've been measuring my original gravities (OG) and final gravities (FG) of my beers. 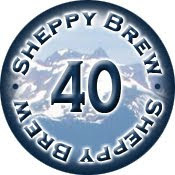 So, if you look at most of the SheppyBrew Nano-Brewery recipes, the listed OG's FG's and therefore alcohol by volume (ABV) are all estimated based on QBrew or Beersmith (software programs I used for formulating my recipes). Late in 2009, I got myself a hydrometer and actually starting taking measurements. My OG's have all been close enough that I feel good about the listed estimates. Some are slightly high and some are slightly low which can be explained by imprecise measurement of ingredients. However, my FG's have all been high. This means, of course, that my yeasties have not been converting as much of the sugars as BeerSmith says they should. The result is less alcohol in my beer. Another potential problem of low attenuation is that my beers could be overly heavy and/or too sweet. Maybe I just like a beer with body, but I have not noticed this as a problem. All my beers I've tasted since I've been taking hydrometer readings have been what I would categorize as great beers. But, I would sort of like to get my FG's down closer to the range that seem to be typical. Usually software and recipe books that list attenuation seem to indicate right around a 74% attenuation is what I should expect for the yeasts that I typically use. Where OG = Measured OG; FG = Measured FG; AA = Apparent Attenuation; Est FG = Target FG (estimated based on 74% attenuation). So, all my attenuation numbers are low compared to what my yeasties should be able to get Those yeasties are either consistently over-stating their abilities, or something in my process is preventing them from performing to the best of their abilities. Since all my batches are Mr. Beer sized ... less than half a typical packet of yeast is designed for, I obviously am pitching plenty of yeast to do the job. So, why are my yeasties under-attenuating? Well, I suppose one thing I should do is review my measurement accuracy. Perhaps I should even check the calibration of the hydrometer, because I never have checked to make sure that distilled water at 60 degrees actually comes up with a specific gravity of 1. My hydrometer is not the most precise piece of equipment and I do not always pay real close attention to my measurements. But, for now, lets assume that I am measuring the specific gravities correctly. One thing I have been doing recently is making sure I aerate my wort better before and after pitching the yeast so that the little yeasties have more oxygen to work with. I started doing this with Leprechaun Stout which is my worst attenuation so far. I've also started to add just a bit of simple sugar (regular white table sugar) to each recipe. I started that with Fools Gold. While that is my best attenuated beer so far, it is still not quite where I want to be. My last couple of batches (Quarter Life Crisis and Brother Bear Dopplebock), I've really paid attention to fully hydrating the dry yeast before pitching. Neither of those are done fermenting, yet, so I do not know how their FG will turn out. I do tend to ferment towards the low side of the suggested temperature range for most of my beers, and until Brother Bear Dopplebock, I have not really been monitoring temperature as closely as maybe I should. So, it is possible my yeasts are getting close to the end of the fermentation and the temp is just swinging out of their comfort range for them to finish up completely. With my new monitoring technique, I will start to pay better attention to temperature swings and try to make sure my ambient temperature starts warming up right when the yeasties are thinking about finishing. Another thing I can do on my partial mashes (Phat & Tyred, Blackhawk Black, and Quarter Life Crisis) is mash at a lower temperature for a longer time. I also need a better way to measure my mash temperature ... but that is probably a topic for another time. Really, when it comes right down to it, if I am expecting an FG of 1.015 and I am getting 1.017, who cares? That actually is well within what I can expect a measurement error. And I am quite certain I would never be able to taste 2 beers that were exactly the same except a 2 point gravity difference and tell you which was which. So, lets not worry about Phat & Tyred or Fools Gold. I'm also not going to worry about the Tweedle Beetle Stout. Originally, I thought it was worse than it actually was because my estimated OG was lower than my measured OG, and I did not adjust my expectations based on the new higher OG. So, I was basing my expectation on 1.020, got 1.026 and thought that was pretty bad. But, I should have been comparing it to 1.023. Actually, considering that this was my first Imperial beer, I should be (and am) pretty happy with 71% attenuation on such a high starting gravity beer. That leaves us Blackhawk Black and Leprechaun Stout. Blackhawk Black is such a fantastic tasting beer that I am removing it from the list of disappointing FG's also. So, I guess that really leaves one beer with a disappointing final gravity. I should not be worked up about the final gravity of one beer. Especially a beer that is made out of so many ingredients I have no control over. And, truth be told, I want this beer full bodied with a bit of sweetness to compliment the peppermint, anyway. So, I guess when it comes right down to it, for this set of beers I actually have no complaints about their attenuation. So, what was my point? Oh yeah, I want to get better attenuation out of my yeast. It is not a big deal since I am making beers that are really really great. But, I just would feel more accomplished if every once and awhile, one of my beers finished at or lower than the expected FG. Obviously, I need more data. Need to brew more beer! Here I am well into my second year of brewing and I have not yet done a lager. Yes, my Rocktoberfest claims to be a dunkle, but it is really a dunkle-style ale. I fermented with ale yeast at ale temperatures. It is an ale. This is a shame that I have been living with a long time. Today, though, I mixed up my Brother Bear Dopplebock and pitched Fermentis Saflager S23 yeast. Mostly, I am relying on the Mr. Beer Linebacker Doppel Bock w/Creamy Brown refill, but I did add some more fermentable sugars to help push its ABV up to style. And, since I added a decent number of sugars, I also added some Hallertauer hops to help add a bit of balance to my beer. The beer is on the low side of ABV according to the style guidelines and a bit on the high side for bitterness, but the hoppiness is still so low, I do not think this is something I would ever notice. I have tried very few dopplebocks in my life, but I do think I'll like the smooth, malty, clean beer (assuming I ferment it ok, it should be clean) with a decent alcohol kick without the alcohol taste (again, making the assumption that I ferment it properly). Which brings me to my main concern: I'm not 100% sure I can ferment a proper lager with my setup. In case you do not know, there are 2 main categories of beers, ales and lagers. Ales are fermented with ale yeast which ferments from the top of the wort to the bottom. Thus, they are called "top-fermenting" yeasts. Relatively speaking, ale yeasts ferment at warmer temperatures than lager yeasts. Lager yeasts, on the other hand are known as bottom-fermenting yeasts because (are you ready for this?) they ferment from the bottom of the wort to the top. I'm not sure why lager yeasts like to ferment differently than ales yeasts do. When I ask, they tell me to shut up ... they are eating. The ale yeasts don't want to tell me either. It must be a secret. I guess, as long as they eat the sugars and excrete their alcohol, I do not really care. Anyway, lager yeasts like lower temperatures to do their fermentation. If you ferment too hot, they produce "off" flavors, which on a lager really do not belong. Because they ferment at lower temperatures, they ferment slower. The yeast I got (Fermentis Saflager S23 yeast) says (this happens to be information that the yeasties are willing to share with me) that it works fine up to 75 degrees, but suggests 50 to 59 degrees F. My experience with ale yeasts tells me that I usually prefer how the final beer tastes if I keep the temperature on the lower end of the ideal temperature range during the main hot-and-heavy reproduction and eating phase. So, I believe that the closer I keep my lager yeasts to fermentation at 50, the happier I'll be with the final product. I have enough experience with ale yeast to know I just need to control temperatures for a few days. I do not have the experience with lager yeasts, but I am told I need to keep the temperature controlled longer due to the slower nature of the lager yeasts. My temperature control is pretty manual. I use frozen ice bottles in a cooler, changing them out when I see the ambient temperature raising. The volume of liquid helps maintain a pretty consistent temperature even if my ambient temperature swings somewhat. Now, I am pretty sure I would be able to keep the cooler cold enough using the same method, however, I am going to be at my wife's sister's wedding during part of the most critical part of fermentation. Bad planning on my part, I know. Well, no point worrying about it. I'm sure I will like the beer that comes out even if it is not truly a great example of a lager. If nothing else, I am collecting valuable data for future brews. The video is of my boil through the hot-break. I am stirring like crazy to prevent an overflow. It worked, but it did get pretty close. Think I probably need a bigger brew pot. So, I don't know if y'all noticed a couple of weeks ago, but this blog had a few posts about windows 7 and Viagra. Maybe one or two more advertisement type posts. I did not post those. Someone out there (maybe several someones) figured out the email address I use for posting blog posts. When I post a blog from my phone, that is how I do it: I simply send an email to my "super secret" email address and some sort of BlogSpot program takes my email and attachments and makes a blog post out of it. It is a real cool feature of BlogSpot. One of the many reasons I am blown away about all the free stuff Google provides. But, since someone (or several someones) figured out how to spam my super secret email address, total strangers could post to my blog. So far, they have not posted anything I wanted on my blog. To "fix" the problem, I changed my settings to put those emails into a draft status instead of posting immediately. After that, I got a couple of "draft" spams, and then, it seemed that they had given up on my blogspot email address. 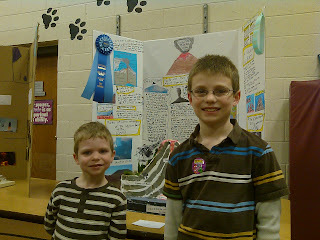 However, after I sent a draft post about Tyler's science fair, I got a bunch more in my draft area of my blog. I do not know if these evil spammers were able to monitor my email or if was just a coincidence that there was a period of non-activity before I used the feature again. I searched the blogspot help to see if this is a common issue (hopefully with a solution) and found one post about it from back in September which was never answered. So, I'm going to leave my setting to keep my emails in draft and have to manually post them. I will probably change my posting email address too. Obviously, letting those emails get posted automatically is probably not a good idea. I certainly don't want to risk the Viagra posts coming up on my blog again. At some point I may just disable the email feature completely, although I hate to let those spammers have that much control over my life. 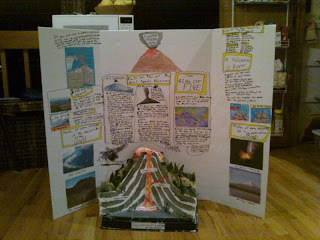 Well, my 2nd grader entered the science fair this year with his project "Erupting Monsters": a model of a volcano along with a display full of fascinating volcano facts. He worked really hard and it looks really cool. You can learn interesting things on his display. Monday night we went to the school to discover that all the hard work paid off with a blue "top honors" ribbon. This (as the name suggests) is the top prize given out at the fair. Tyler and two other 2nd graders got this ribbon. 2 or 3 of each grade seemed to get one. 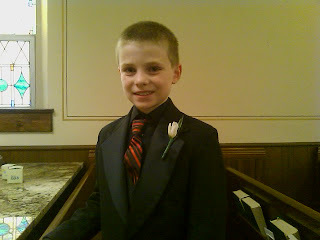 So, while it was not as if he made THE best science project in his school, he did get the highest award they gave out. Outstanding work by the young man. I am proud that he got the honor, but I am even prouder of the effort he put into it. He did work very hard. He probably put more effort into this than I ever put into anything when I was in grade school. Gets the brains and work ethic from his mother, obviously. 40 is an interesting number. Rain fell 40 days and 40 nights wiping out all life on Earth minus those on Noah's little boat. Moses lead his people around the desert for 40 years. Moses ended up on Mt. Sinai a few times for 40 day / night periods. Jesus was presented at the temple 40 days after his birth. Jesus fasted 40 days and 40 nights before the devil tempted him. It was 40 days after the resurrection of Jesus until the ascension of Jesus. The are many many other references to 40 not only in the Judaic / Christian faiths and other major religions. I am not (cannot) list them all. One issue with turning 40 is that it brings me to the realization that my life is almost 1/4 over. I used to think 40 was old, but I do not anymore. I do not think I feel any older now than I did 10 years ago. I'm still trying to figure out what I want to "be" when I grow up, so I cannot be too old. Although, as I am 1/4 aged, maybe I should figure that out. I'm thinking maybe something in computers. I just am not sure there is a future there. My nickname is still "Sheppy". Does that sound like the nickname of an old guy? When I came downstairs on my birthday, my beautiful wife was making me breakfast. This is not a normal occurrence on a weekday. I got 40 kisses each from my wife and 2 kids right before I got my breakfast (120 total kisses). I even got a candle in my omelet. I blew it out like a champ and made my first birthday wish. I cannot tell you what the wish was, but I will say it would make my wife blush if she knew. Of course my wife and I had to go to work. The kids had to go to school. There was nothing special about the work day except I got a bunch of "happy birthday" messages via email and on facebook. Getting home was great. It is always fun to see the kids excited and they were very excited to give me gifts (various pieces of artwork) and shower me with love. I'm a lucky guy. My wife got me "Brewing Classic Styles" by Jamil Zainasheff and John Palmer, which is a book I've been considering buying for myself. Now I won't have to. She also got me a get-away weekend starting later today. The kids are staying with their friends Miles and David, and our neighbors (all with multiple fire arms and other weapons) will be watching the house in case random Internet thugs come across this blog entry. Tyler and Connor tricked me into thinking we were going out to get birthday candles and batteries when, in fact, we left to go to the Outback Steak house where I had a very nice meal. Then we came home for cake and ice cream (yummy). I was so busy being showered with love and attention, I did not even have myself any SheppyBrews yesterday. My sister and her family sent me sheets of their middle child's math homework on them. As far as I could tell, he got all the answers correct. They were not graded, so I hope that he doesn't get in trouble for not turning them in. Actually, the homework came on the back of sheets of paper talking about the other thing in the package: Crafty Caps -- bottle caps that say "Sheppy Brew 40" with a tiny little picture of the mountains that are on the back of one of my label styles on them. So a few of my next beer batches will have some of these customized bottle caps on them. I'm not sure if the homework or the instructions or the bottle caps are the actual gift that my sister was so proud of. By the way, sis, you can let people know now what you got me, they were in the mailbox last night. So, as you can probably tell, I had a great 40th birthday. I am a lucky guy with a completely charmed kind of life.